The smart machine concept has a number of key enablers (from the technology perspective) and drivers (from the end user and market perspective). The combination of both will lead to machines that are safe, secure, self-aware, flexible and capable of meeting demands from both end users and consumers. The integration of internet connected devices, adoption of automated components and processes, and access to real-time production data, will empower end users to migrate to smarter machines. As production benefits in terms of cost reduction, reduced downtime, quality, and throughput, are achieved and competitive advantage gained, so the drive to smarter machines will quicken and expand into a broader spectrum of industries. Self-awareness – Any deviation from set parameters will be identified by the smart machine and communicated to the machine operator. Machines at the forefront of development will use sensors with embedded intelligence to distribute and automate decision making on the factory floor. Plug & play – Any new smart machines will need to be compatible with the existing installations or machinery from multiple OEMs; End users want devices that can be installed within a short timeframe. Integration into the rest of the system must be easy. Safety & cyber security – With security built into their fundamental designs, smart machines will improve safety of operators and minimize the security risk of increased networking. Connectivity – Smart machines will connect directly to the broader (IP-based) network. This enables data sharing and production planning, which goes far beyond the capabilities of traditional standalone machinery and automation. 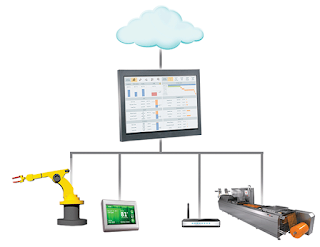 Smart machines will bridge the IT / OT gap, making available production data that can be used in numerous management settings (e.g., stock control, operator scheduling, maintenance, energy management, and product replacement). Major trends that support the proliferation of smart machines include the acceptance of mobile devices to manage core business functions, and the ability to harness and interpret the mountains of data that are being captured by the smart devices. 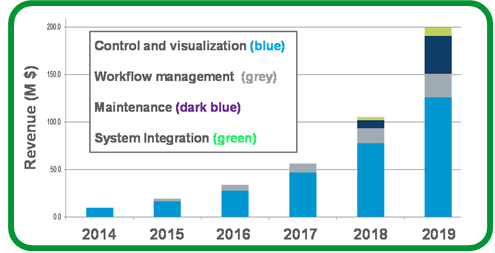 Data Management – As sensors and other networkable components are added to machinery, huge amounts of production data are being generated. Even with relatively simple applications, this could easily lead to data overload and the inability to use production data to support real time decision making. Smart machines must have some level of intelligence to assess data quickly and in a decentralized fashion. Routing all data to a central control for analysis will quickly lead to delays, and is an un-scalable structure. Having sensors, components and machinery with the intelligence to only share data that falls within a set of pre-defined parameters, will lead to better data management. Reducing the level of data shared with the broader network/community, will speed up decision making and reduce backlogs (where critical information could be delayed or missed altogether). This guest blog written by Dr. Rainer Beudert, Marketing Director, Machine Solutions as part of the white paper: ”The Industrial Internet of Things: An Evolution to a Smart Manufacturing Enterprise”.